When I announced to my colleagues last summer that I was booking some annual leave to sit in a field in Dorset with a bunch of other communications people, it’s fair to say they thought I was a bit bonkers. Why drive five and a half hours to sleep in a tent and talk about work when you could be lying in the sun on a Spanish beach, cocktail in hand, in pretty much the same time? But I can honestly say that my time spent at the inaugural Comms Unplugged last September left me feeling more refreshed than any other time away that year (and I’m known for taking a lot of holidays). It wasn’t the jolly some may perceive it as (although we did have a lot of fun and gin), but a genuine learning and development opportunity – and with hindsight it’s definitely something people should be attending in work time rather than using annual leave. For those that aren’t aware, Comms Unplugged is a conference for communicators but with a difference. There is no technology, no mobile phone signal, no PowerPoint and no staid event space. Instead you have inspirational speakers who you actually listen to because you’re not sneakily trying to send an email on your laptop, and workshops to both improve your mental well-being as well as your knowledge and understanding around key communications issues. And best of all you get to network with like-minded individuals around a camp fire rather than all staring mindlessly at your phones in an overpriced hotel bar. I left Comms Unplugged 2017 feeling completely revitalised and buzzing with enthusiasm after a break from all social media (and I’m a self-confessed social media addict), some fresh air, my first ever attempts at both Pilates and mindfulness (not at the same time), and a group of new friends who I had laughed until I’d cried with while setting the world to rights under the stars. But it wasn’t just the well-being aspects of Comms Unplugged that I benefited from. The speakers and workshops at Comms Unplugged genuinely taught me a lot and made me think differently about aspects of my work. It was also a fantastic networking opportunity and almost a year on there are still people who I am regularly in touch with, and who I can feel comfortable in sharing ideas with and asking for advice. 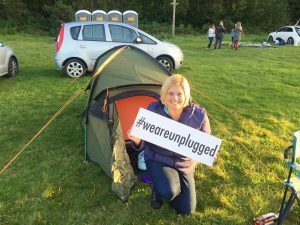 Yes Comms Unplugged is different to a ‘traditional’ style conference in a hotel – it’s different and it’s better for it. It’s got all the positives of attending a ‘normal’ conference, but with the added benefit of learning about how to improve your well-being and a physical break away from technology that works wonders for your mental health. It’s time we all start understanding the importance of well-being and the impact it can have on our working lives. Working in communications can be really stressful, with tight deadlines, the juggling of multiple tasks, constant restructures – and it can be hard to escape from with many of us glued to social media in our own personal time as well as having to use it at work. So any event that can combine a focus on well-being along with learning and networking is an absolute no brainer for me. Comms Unplugged 2018 is going to be one of the communications learning and development events of the year, and I defy you to leave without a big grin on your face and lots of new ideas. So get lobbying your boss to book you a spot (use this cut out and send letter if they still think it’s just a jolly…), pack your tent, and turn off your phone!